… Okay, they don’t laugh too much. But they are really, truly great friends, and I am so thankful that they choose to put up with my spontaneous, selfish, sassy, passionate, and goofy ways. In mid-July, I was home for a long weekend and decided to visit my good friend Maida in New York City, my favorite city and future place of residence, where she is a summer intern at CBS. (I have no words and so many words to describe what Maida means to me—which is why I’ll be featuring her in my next blog post. Look out for that, cuties.) On a sunny Thursday morning, I booked a round-trip bus ticket at a shady pharmacy/cigar store that not even your nightmares could fully imagine, and half an hour later I was sitting in the window seat of a coach bus rumbling down the winding roads of rural-suburban Pennsylvania. I found myself at Port Authority at 2 o’clock in the afternoon with a solid four hours to do with as my choosing before I was supposed to meet Maida in the Upper East Side. In Paris, I got quite good at killing time by wandering around the city like a homeless person, so I set off. I opened the PABT glass doors and was hit in the face by eighty-thousand degree weather. (Fahrenheit, not Celsius. Let’s not get too ridiculous here.) This is gonna be fun. I jaunted up to Central Park, where I sat for an hour or two under the shade of a large oak tree and read a few chapters of The Omnivore’s Dilemma by Michael Pollan. (Just kidding. I sat for about ten minutes, sent Snapchats on my phone, and enjoyed the pleasant ambiance of a young child fifty feet away screaming bloody murder to his mother.) Eighty-thousand degrees in the sun translates to about seventy-thousand degrees in the shade, so I was outta there tout de suite. Next, I hightailed it to the nearest Starbucks in the hopes of buying an ice cold drink and waiting out the next hour in air-conditioned bliss. (Another joke—about twenty seconds after I sat down with my juice, an employee came up to me and explained that the store would be closing because the air-conditioning system was broken. I stared at her like this.) So about the time I shuffled back into the death sauna that is New York, my friend Alex texted me asking to see me after work. We met on 59th and started walking up north to where I’d meet Maida. Along the way, I would frequently exclaim something along the lines of, “Look! A candy store! Let’s go in!” and stroll right across the street without even waiting for his answer (or to see if a car was about to hit me). Alex is a good friend. And he knows how to pick his battles. With me, at least. This is Alex standing in front a massive wall of candy. As you can see, his enthusiasm for all things sugary is not quite as expansive as mine is. He’s also a sass-ball at his finest. Soon after, Alex had to catch a train home, and so I was left to my own devices once more. 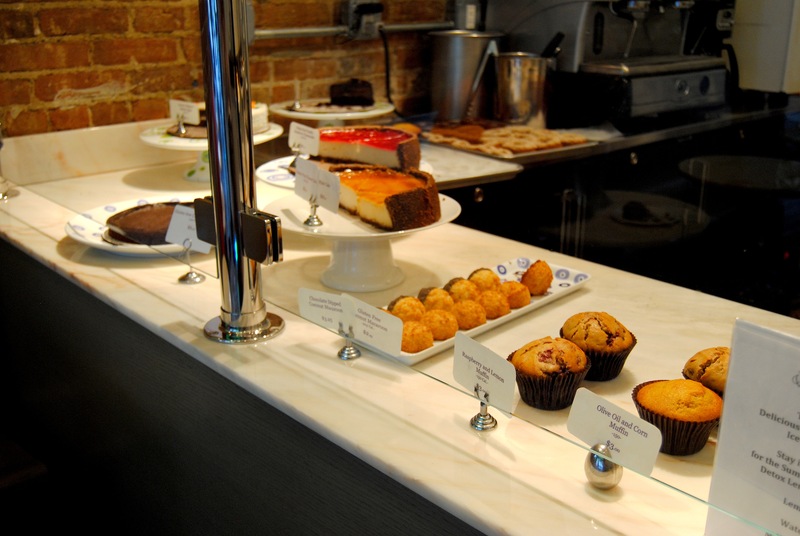 I found myself in the open, air-conditioned arms of Sur La Table, a cooking and baking store. It was beautiful. I am so very predictable. After looking at forty different types of silicon spatulas, I had wasted away enough time to meet Maida after her internship at a vegan bakery called Vegan Divas. It was a tiny store, nestled among miscellaneous dry cleaners, grocery stores, and nail salons—so tiny that Maida almost walked past the store without seeing it. 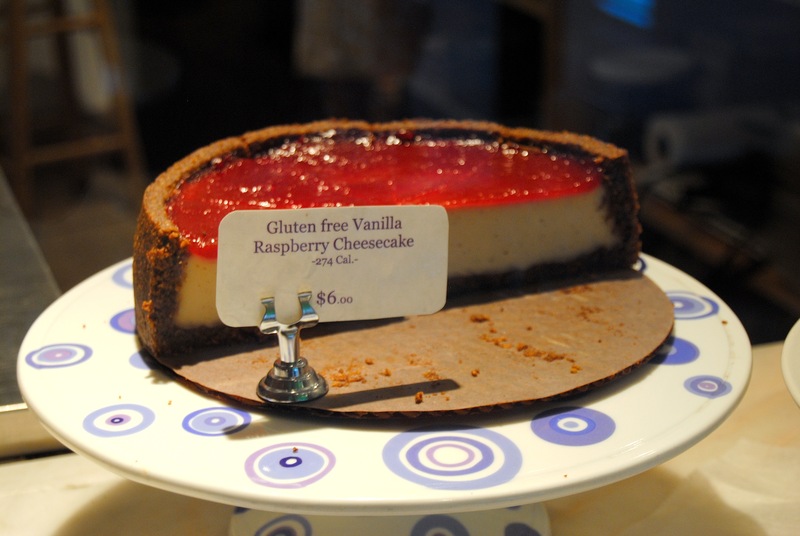 The inside of the store was small, crisp, and clean … but nothing compared to the dairy- and egg-free DELICIOUSNESS that awaited us. 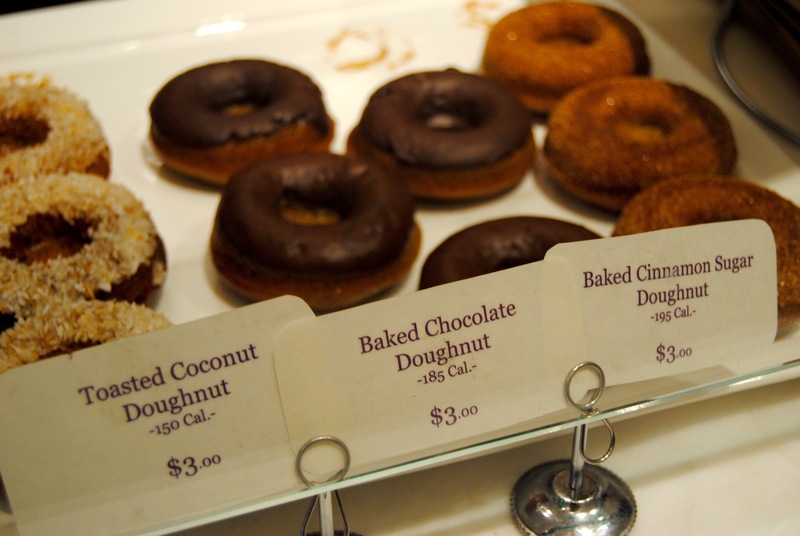 Donuts, muffins, coconut macaroons, cheesecakes, chocolate cakes, carrot cake, cookies … and all of them were vegan. This is essentially what I looked like when I stepped up to the glass. Everything was so beautiful. Mini donuts. Literally the cutest things I’ve ever seen in my entire life. Maida and I may or may not have bought a slice of this raspberry cheesecake “for later.” Which invariably meant that after stumbling home from a night at the bars, we shoved bite after bite of this cheesecake into our faces in ten seconds flat. 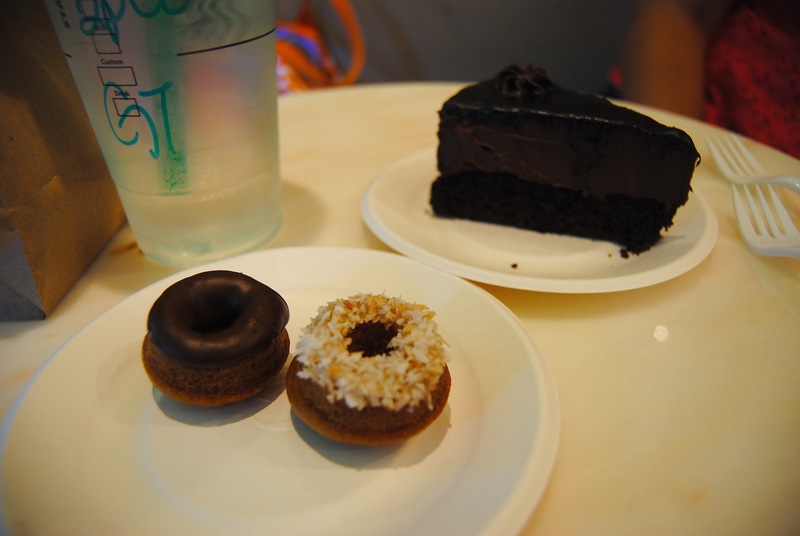 At the bakery, we sat down to share two mini donuts with chocolate and coconut icings and a gluten-free chocolate cake. The donuts tasted fantastically buttery (with no cow butter in sight), and the cake was incredibly rich and moist. And both were guilt-free—between the two of us, we each consumed about 200 calories. Dayum. 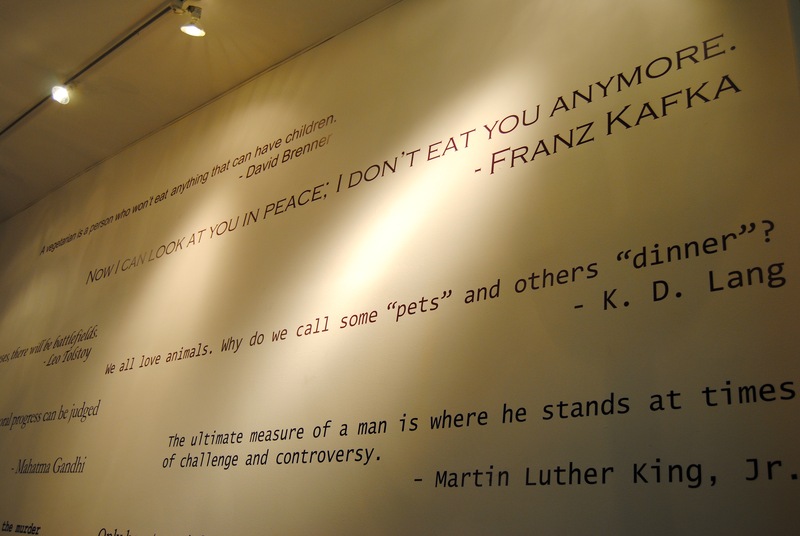 Before leaving, I snapped a quick pic of the bakery’s wall, which was covered in inspirational quotes by a lot of famous dead guys. It was pretty neat. Atmospherically, the restaurant’s not great. The front of the restaurant is as tiny as a matchbox. There are literally three tables. We almost had to get our sushi to go until a group left a tiny table near the window, and we snagged it. Note: no one cleared the previous customers’ plates while we were eating. So that wasn’t cute. Orally, the food was BANGIN’. 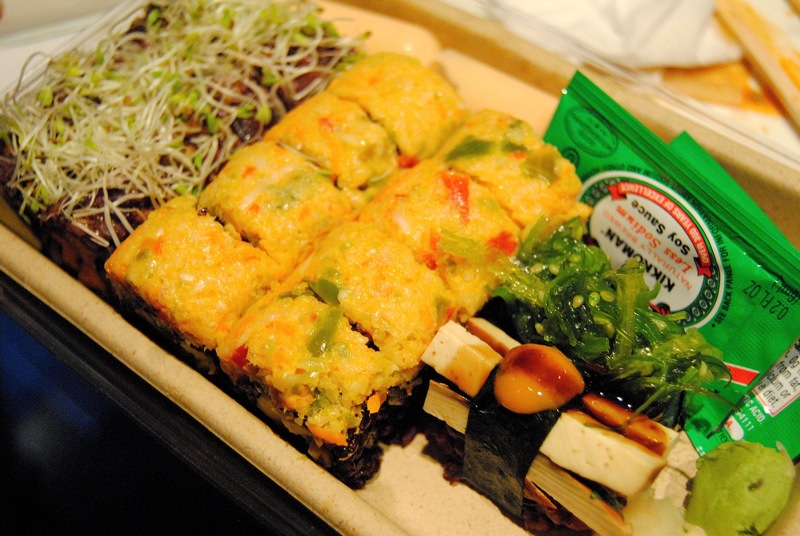 My usually vegan sushi go-to is a veggie roll with avocado and a tempura sweet potato at best. This … this was incredible. I’ve never tasted sushi made with raw fish—I have a strong taste/texture/anything aversion to seafood, it gives me the creeps—but this was better. It was just so so so so so so so good. So good. Maida got a ‘Nutty Buddy” (I think?) 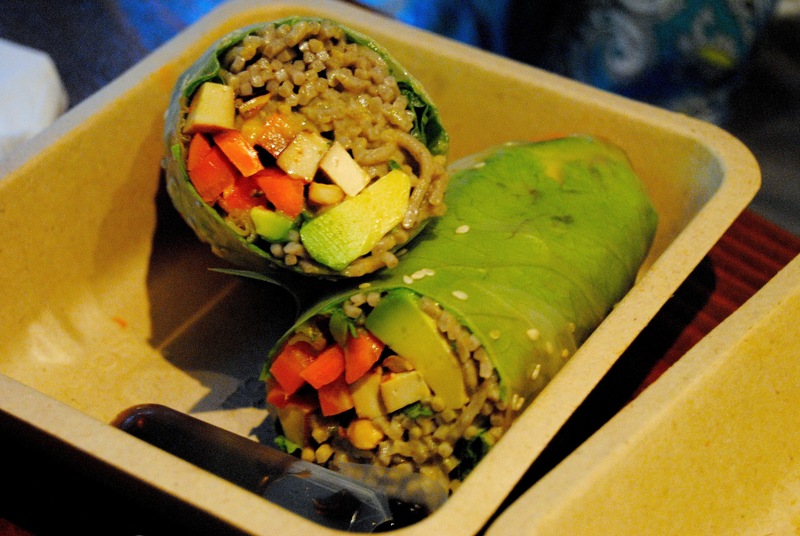 lettuce wrap with buckwheat noodles, avocado, carrots, tofu, and peanut butter. Umf. She also got a seaweed salad—a food I will never understand because who wants to eat an entire salad made of seaweed!?! I got a ‘Sweet Tree’ roll, a ‘Spicy Mang’ roll (avocado, cucumber, and mango wrapped in black rice), a tofu piece, and another piece that I cannot remember for the life of me. Sweet Tree was the most delicious sushi I’d ever tasted. Spicy Mang was a close second. Ugggh. So good. Maida, Brandon, and I left the restaurant fully satisfied and not missing “the real deal” one bit. That’s the thing with vegan food—it’s kind of it’s own breed. This “sushi” certainly wasn’t sushi in the traditional sense; but it was tasty. The best tasting vegan food doesn’t try to mimic non-vegan food. (Have you ever tasted a vegan hot dog that tasted as good as a meat hot dog? Hell, no!) 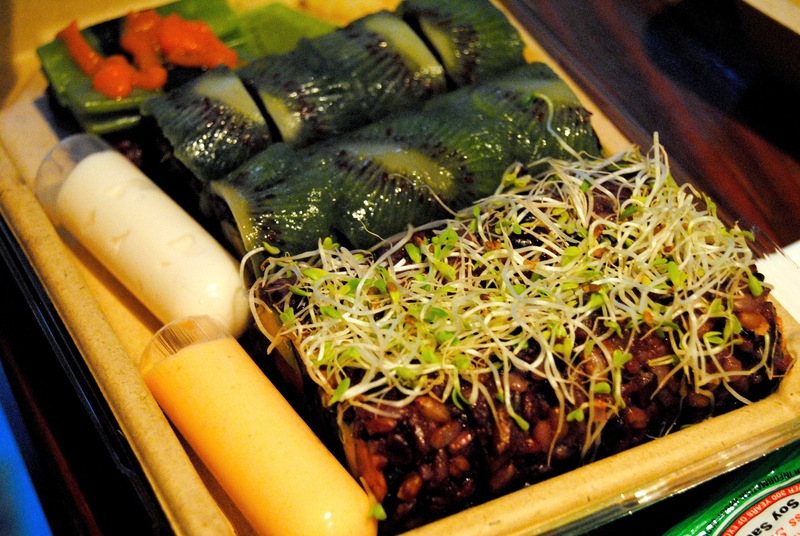 Good vegan food creates something new, something our palates haven’t tried before. And trust me, I’d be willing to try this sushi over and over. And before I knew it—literally before I knew it, because I think I was still feeling the effects from the night before—I was back on a rumbling bus to rural-suburban Pennsylvania. Less than 24 hours in New York taught me many things—including always set multiple alarms because you are guaranteed to sleep through just one—but the most important thing it taught me was that I have some great friends. I think the reason I’ve been able to stay vegan is because I have so many supportive people in my life who are willing to learn, to try new foods, and to question my beliefs and actions with respect and genuine curiosity. My advice to you if you’re trying to be vegan is to either A) steal my friends or B) make your own friends just like them, ‘cuz I wouldn’t be the person I am without them. As the title of this blog suggests, I love New York. But, after a vegan 24-hour whirlwind throughout the city, I’ve come to realize that I love my friends even more. 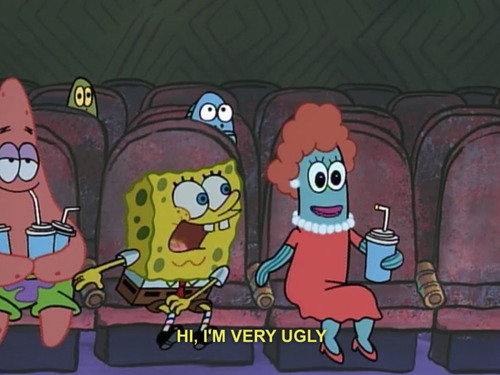 Spongebob gifs courtesy of tumblr. If you appreciated them, there’s more where that came from. If you didn’t appreciate them … we can’t really be friends anymore. Much thanks to Alex for introducing to me the YouTube video linked above. If you read this entire blog post … Wow. Committed. Thanks. P.S. Today is my half birthday, so naturally I bought a slice of vegan chocolate-peanut butter cake from the nearby vegetarian restaurant and ate it for dinner. I am mostly proud of this. I just wanted you all to know. Tags: baked goods, bakery, beyond sushi, cake, candy, central park, cheesecake, chocolate, dessert, dinner, donut, friends, kris jenner, lower east side, muffin, new york, new york city, port authority, spongebob, starbucks, summer, sun, sur la table, sushi, tofu, upper east side, urban outfitters, vegan, vegan divas, vegetarian. Bookmark the permalink. Actually your mom and I are first cousins! Her dad (your grandfather) and my dad are brothers! No way! Does the sweet tooth run in the family? Definitely! And the sense of humor! Hello Rachel! Your writing style is terrific. Easy to read , witty and funny. No surprise a bit of sarcasm makes it perfect! I miss your face and hope to see you next time you grace the East coast. I’m still set on featuring you in one of my posts! Your chocolate cake recipe is now go-to whenever my friends have birthdays. They have no idea it’s vegan! Also, this won’t be the last time Christina is featured on the blog … look out this weekend for something special we collaborated on. It will make you proud!